A Federal High Court in Lagos on Tuesday convicted nine foreign citizens for stealing 3,423.097 metric tons of crude oil from Nigeria. Among the convicts were five Filipinos and four Bangladeshes. They had been intercepted by the Nigerian Navy on March 27, 2015, while trying to export the stolen product loaded in their vessel, MT Asteris, out of the country. On Tuesday, Justice Ibrahim Buba convicted them on four counts bordering on the crime and sentenced each of them to a jail term of five years with an option of N20m fine. In handing down the sentence, Buba said he was satisfied that the Economic and Financial Crimes Commission, which prosecuted the convicts, proved its case beyond reasonable doubts. “The case of the prosecution is as clear as the daylight,” the judge held, adding that the failure of the convicts to supply the evidence that they had lawful permit to deal in crude oil further strengthened the prosecution’s case. The judge said it was the likes of the convicts that made Nigeria a laughing stock in the eyes of the world. He said it was not right for anyone to deprive the country the enjoyment of its natural resources through illegal means. Buba said the court had the duty to send a strong signal to Nigerians and non-Nigerians alike that the country had laws and the laws were enforceable. “It is not right for either Nigerians or foreign nationals to deny this country its God-given natural resources through illegal means. Accordingly, this court hereby sentenced each convict to five years term of imprisonment on count one with effect from March 27, 2015 with an option of N5m fine,” the judge held. He also sentenced them to five years each on counts two, three and four or a fine of N5million on each count. He said, “All the sentences are to run concurrently, but not the option of fine. In addition, the vessel, MT Asteris, and the cargo on board are forfeited to the Federal Government of Nigeria. 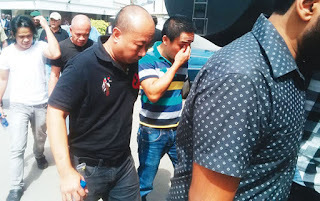 The foreigners who were convicted and jailed are Axel Jabone, Zahirul Islam, Juanito Infantado, Suarin Alave and Gatila Gadayan. Others are Islam Shahinul, Islam Rafiqul, Shaikh Nomany and Rolando Comendador. The EFCC prosecutor, Mr. Rotimi Oyedepo, had told the court that the foreigners acted contrary to Section 1(19) (6) of the Miscellaneous Offences Act, Cap M17, Law of the Federation of Nigeria, 2004, adding that they were liable to punishment under Section 17 of the same Act. Oyedepo said the foreigners also ran foul of Section 4 of the Petroleum Act, Cap P10, Law of the Federation of Nigeria, 2004.